Organizers of the Santa Clarita Performing Arts Center (PAC) at College of the Canyons “Rock the Rhythm, Beat the Odds” project have successfully implemented the initial stage of a hybrid music education program meant to showcase the importance of arts education, while bringing together more than 10,000 local students and community members in an attempt to set a Guinness World Record for the world’s largest drum circle. Rock the Rhythm, Beat the Odds is being produced by the PAC K-12 Arts Education Outreach Program, with generous support from Remo Inc. and several other local businesses, organizations and community members. 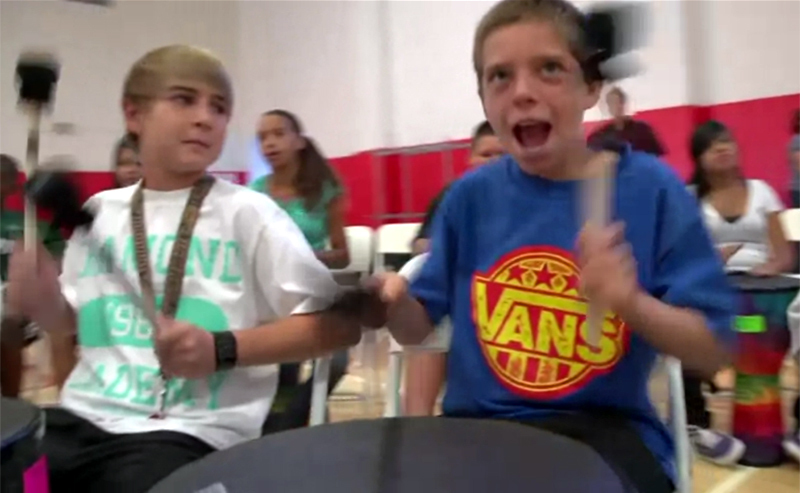 As part of the project, every sixth- and seventh-grader in the Santa Clarita Valley has now received music and rhythm instruction, designed to maximize each student’s creative expression, build social and emotional skills and emphasize the process of learning over performance. On the morning of Friday, May 18, 2012, all participating students and their parents will be invited to Cougar Stadium on the College of the Canyons Valencia campus, to assemble what could become the world’s largest drum circle. It is hoped that this incredible effort will cast a national spotlight on the Santa Clarita Valley, while showing what can happen when a community comes together to make a difference in the lives of students by imparting the importance of arts education in the development of the whole child. Remo Belli, the founder of Remo, Inc., Remo President Brock Kaericher, and the entire Remo staff have all played key roles in helping to bring the Rock the Rhythm, Beat the Odds initiative to life. In addition to providing drums and other forms of logistical support, the company is now in the process of making the more than 11,000 sound shapes (percussive instruments that will be used at the stadium) required to break the current drum circle record of 10,180. These instruments will be provided not just to the students who will be gathered at Cougar Stadium, but also to all participating attendees in the stands and around the stadium, who will be integral to the process of attempting to set a new Guinness World Record. Once assembled inside the stadium, these students will join their fellow sixth- and seventh-graders, with instruments in hand, to form a unified team of amateur musicians. The PAC K-12 Arts Education Outreach Program continues to provide incredible opportunities for the youth of the Santa Clarita Valley through valuable partnerships with major arts organizations in California and across the nation. The program uses the college’s cultural and community resources to expose Santa Clarita’s student population to top-tier, visual and performing arts standard-based arts activities and integrated performing arts learning opportunities. The Outreach Program has at its core a collaborative approach, partnering with teachers and administrators in school districts, and community-based organizations throughout the area to develop an enhanced arts education curriculum and a variety of unique educational opportunities for all students.